Durban – After their recent announcement that they will be racing the ICF Canoe Marathon World Championships together, Hank McGregor and Andy Birkett took on their first surfski race together when they won race three of the Bay Union Open Ocean Surfski Challenge, the Geriatskis Doubles Race, while Donna Winter and Jenna Ward won the ladies race on Sunday. The Euro Steel duo, who won the FNB Dusi Canoe Marathon in February, are a devastating combination in a boat and to see them in a surfski together is another intimidating sight for any would-be challengers. “It was great to be in a double ski for the first time with Andy and we had a great day out, awesome conditions for surfski paddling,” McGregor commented. Birkett echoed McGregor’s comments about their day on the ocean and they were both happy with a win in their debut race together. “I think that the conditions were a lot better for doubles skis and we had a good race. I really enjoyed it and I am looking forward to another paddle together soon,” Birkett said. The dream team were in control of proceedings when they manged to maintain their early lead throughout and win the race by 30 seconds over Luke Nisbett and Gene Prato in second place, while Matt Bouman and Andre Pohl finished in third. The ladies race was won by another impressive duo. Jenna Ward and Donna Winter won the ladies race in convincing fashion when they dominated the rest of the ladies field. “Conditions were great!” Winter said after the race. “It was pretty flat but we paddled in a north easterly which meant it was quite a difficult paddle to the turn buoy but the way back there was a nice little bump with a few runs. 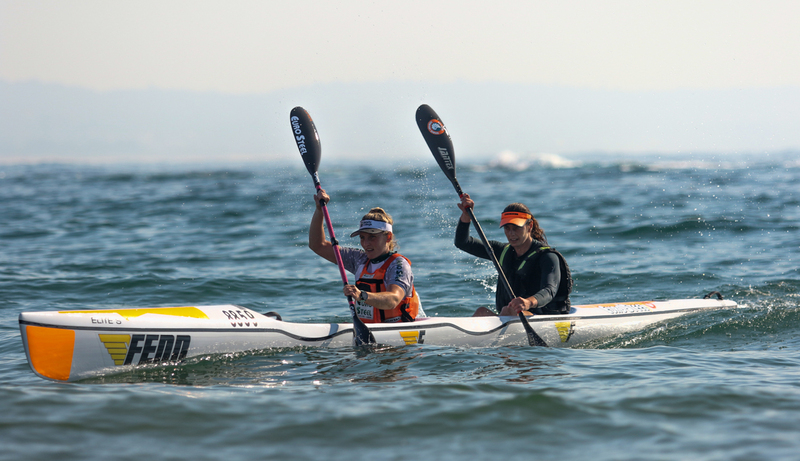 It was a terrific effort from the winning pair of Ward and Winter as they powered to a ninth place overall finish and a win of over four minutes ahead of Bridgitte Hartley and Melissa van Rooyen. Lyn Bennett and Debbie Gillet rounded out the ladies podium. Taking the mixed category was the young pair of Cameron Hudson and Sabina Lawrie. The pair were also in fine form as they rounded out the top ten and took the mixed category by over four minutes. Experienced ocean racer Herman Chalupsky took home the singles honours ahead of Stuart Roberts and Sam Butcher. Over the short course it was an exciting shootout for the top spot on the podium that was eventually won by Jody and Duane Taylor ahead of Murray and Dylan Smith by just five seconds. Finishing third over the short course was under 18 girls pair of Alice Edward and Tayla Gilmore.